By the time this post is read, Christmas will be over and done! I know it will be wonderful as we will be surrounded by family for the whole week! In pre-typing a post to run after Christmas, I wasn’t sure what to write, since the holiday events, both expected and unexpected happenings, haven’t actually happened yet! Therefore, I thought I’d post a few random thoughts, or not so much so. This photo just proves you can do a lot with a small space! A new kitchen is a huge want of mine, but not a need! You all know by now I, we, do a ton of cooking and baking out of this here, raised ranch, gazebo style (apparently that’s what it’s called due to its round shape) kitchen. The house was built in 1976 and I’m pretty sure the kitchen is just about original, other than the relatively new appliances that we’ve purchased since we moved in 12 years ago. 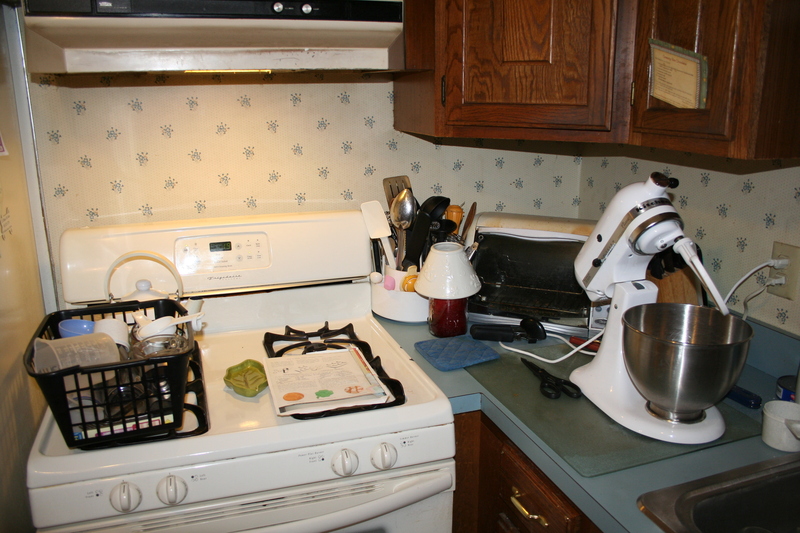 I just figured I’d show you were I do most of my cooking and baking from, and it’s right here in this little corner of the kitchen between the sink and the stove. You can see that you don’t need a ton of space to do a ton of cooking! I utilize the space right on top of the stove all the time. You can even see the cabinets where I stick all my little recipe cards into the grooves, so I can read while I bake. The one that’s there permanently all winter is the one for the Creamy Hot Chocolate. 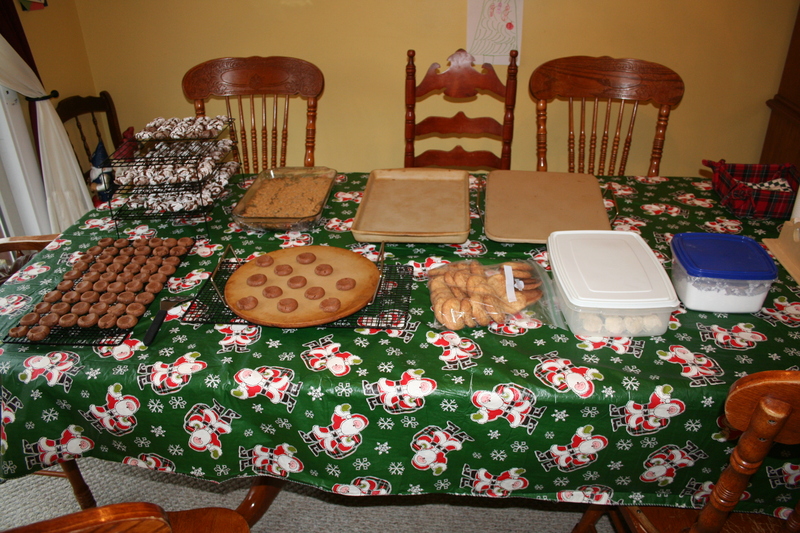 When I need to spread out, there's always the dining room table. If I find that I need more work space than my corner of the kitchen, I move into our dining room and use that table. We do not have an eat-in kitchen or an island in the kitchen, so this is where we eat all of our meals, and do all of our crafts, where I type my articles and blog posts, where the kids do their homework, etc. At our school we have a “multipurpose room” which serves as the gym, the auditorium and the cafeteria. We call it the Cafa-gym-atorium. Well in our house, this is our island-a-kitchen-dining-room- table-atorium. Again, as much as I want more space, this works just fine. Yup! 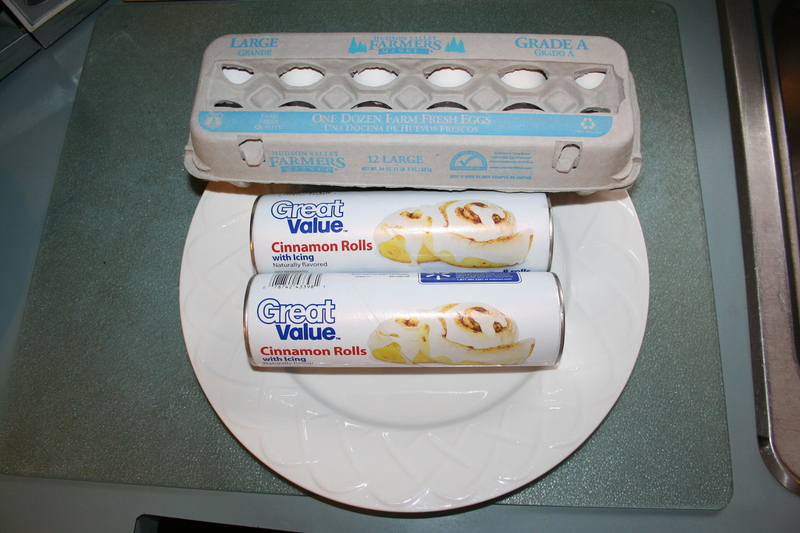 Cinnamon Buns and hard-boiled eggs. I don’t even make the buns from scratch–at least not yet. I buy whatever store brand I’m in during my travels the week of Christmas, either Walmart (as these are) or PriceRite or Aldi’s. We usually throw in some fruit or some Christmas cookies along with it, but that’s it, that’s our breakfast! We host Christmas dinner so that’s quite a bit more elaborate than our breakfast, but this takes the pressure off of me, of us, for just a little while, so that we too can enjoy Christmas Eve, Christmas morning and all that goes along with it. And, the cinnamon buns…. are just delicious!! This week for part of the week I’ll be spending a few days discussing our Christmas dinner meal and how we pull off a lot of it by preparing it ahead. Be sure to check back each day. I promise it’ll leave your mouth watering! Too funny Jen, our traditional Christmas morning breakfast is cinnamon buns and fruit too! This tradition started (not intentionally) when Brad and I were first married. One Christmas I decided to make something else and Brad was disappointed we weren’t having the cinnamon buns. So from that point on it has continued. Now we also do cinnamon buns on each kid’s birthday morning and Easter morning. Ohh, the french toast Cinnamon Buns sound great! Actually a local breakfast restaurant has them on their menu. My aunt gets it when she visits. It is very sweet.